Educational Studies in Mathematics (ESM) has reached a special point in its history. Some 50 years ago, in 1968, it was founded by Hans Freudenthal, and now, January 2019, it offers its 100th volume. We celebrate these milestones in several ways. First, we invited Danny Beckers, who is working on a double biography of Hans and Susan Freudenthal, to write a brief history about the inception of the journal in 1968. In tracing Hans Freudenthal’s reasons for founding ESM, Beckers also alerts us to the influence of Susan on Hans, and on education more broadly. Second, we asked former editors of ESM to select a significant ESM article and explain why it has had such impact. These articles will form a virtual special issue that is open access for some months. Third, we invited Merrilyn Goos to write a reflection on a topic that she cares about. She has chosen to reflect on ESM articles on mathematical thinking in the period of her editorship. Fourth, Vilma Mesa and David Wagner are working on a trend analysis of author demographics and reviewers’ demands. We hope that these four contributions will appear in the 100th volume, spread over three issues. Since Merrilyn Goos asked me to become the new editor-in-chief, I have gradually become aware of the huge amount of work she has done for the journal. Even as associate editor for 5 years, I had only seen little of what was going on behind the scenes to keep the journal healthy. She has managed, along with the associate editors, editorial board members, and reviewers to bring down the time between submission and decision; our ambition is to keep decreasing this time without making concessions to quality. The number of submissions has increased to over 300 per year. Moreover, the impact factor has gone up gradually over the past years to 1.100 in 2017. We hasten to say the impact factor is only one of the many indicators of quality. At least as telling is the high appreciation of the journal in several studies of journal quality in mathematics education (e.g., Nivens & Otten, 2017; Törner & Arzarello, 2013; Williams & Leatham, 2017). On behalf of all readers, I would like to thank Merrilyn wholeheartedly for all she has done for the journal, its readers, and authors. I would further like to welcome Tamsin Meaney as a new associate editor. She has served on the Editorial Board for quite some time. With her broad international experience and coverage of many relevant areas of research, she will be a wonderful addition to the team. Last, you may have noticed that the layout of the journal has changed. Springer is standardizing so as to be more efficient. This also impacts the reference style that ESM will be using. For many years, ESM has used the APA6 guidelines of the American Psychological Association, along with many other educational journals. However, production will be smoother, cheaper, and faster now as ESM turns to Springer house style (which is rather close to APA6). We therefore recommend authors to study the new author guidelines as soon as they appear online. It is a privilege to host the journal in Utrecht, at what is now called the Freudenthal Institute. 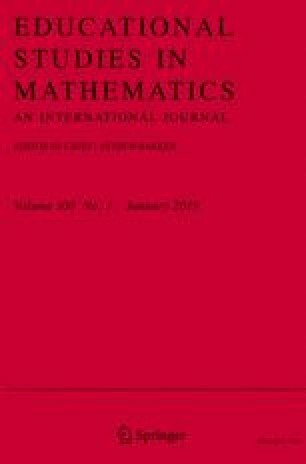 I look forward to working with the associate editors, editorial board members, reviewers, and authors to share the best educational studies in mathematics with researchers, educators, and teachers worldwide through the journal.